So, your on a diet and feeling deprived. You are eating veggie burgers, tofu and salad but feeling like you want pizza. I have had whole wheat pizzas before and thought that they were ok, but I always kind of knew that there had to be a way to make a whole wheat pizza even better. So, you will not have to use up too many of those Weight Watcher's points and satisfy that inner pizza lover who wants to be set free. I would use less cheese. I would use Fresh Mozzarella, the fully fatted one, but much less of it. I would use some part skim shredded Mozzarella to round it out. I would use the very best quality ingredients I could find. For one thing, I remember that many whole wheat breads, as they are good for you with all the bran and other healthful stuff, tasted like I was eating sawdust. I knew I didn't want that for my whole wheat pizza . I found this flour at the local supermarket in the natural foods section. 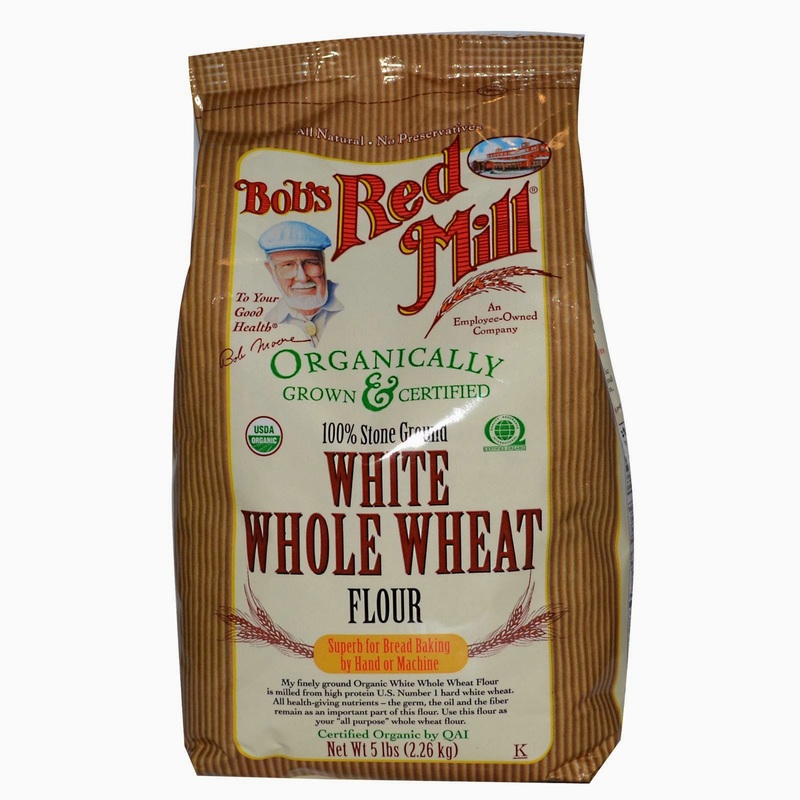 Bob's Red Mill is a great company that makes excellent products. I would highly recommend any of his products, as the company has integrity. Armed with this white whole wheat flour, I decided to craft a whole wheat pizza dough using it. Put the water, olive oil, sugar and salt in your mixer and mix it until all the sugar is dissolved. Add the yeast and gently mix it in to incorporate it. Wait 10 Minutes. Add the rest of the ingredients. Slowly pulse the mixer to wet the flour. When the flour is wet, mix on slow using the dough hook on your mixer. If the dough seems dry, add a little water and continue to mix until a dough is formed. Turn up the speed and knead in the mixer for 5 to 10 minutes. Take out the dough, cut into three equal sizes and bake three whole wheat pizza dough balls. Coat the whole wheat pizza dough balls with a thin layer of olive oil and put into three separate containers or zip-lock bags. Once you have the whole wheat pizza dough made and aged for at least a day in your refrigerator, then you are ready to make a delicious whole wheat pizza. 6 Ozs of Fresh Mozzarella Cubed into 1/2 inch cubes. To make this whole wheat pizza recipe, we are going to use the same techniques described in the New York Style Pizza post. Please read that post fully before you get started. Take a whole wheat pizza dough out of your refrigerator for at least a 1/2 hour to rest. Preheat your stone as described in the NY Pizza post. Place your Diced Tomatoes in strainer and drain out the excess moisture. Evenly flour your pizza dough for easy handling. Form your dough by either hand tossing it or using a rolling pin and put it on a pizza screen or pan with holes in it. Sprinkle the top of the whole wheat pizza dough with the garlic. Spread the drained tomatoes across the top of the pizza evenly. Sprinkle the Romano Cheese across the pizza evenly. Now is the time for the cubes of Fresh Mozzarella. Evenly distribute the cubes. There will not be a lot of them, so dot them around the whole wheat pizza strategically. 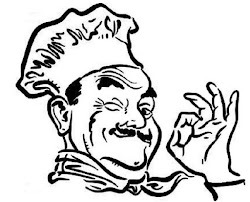 Sprinkle the remaining shredded Mozzarella around the rest of the pizza. There is about a third of the cheese on this whole wheat pizza, so spread it out evenly . Grind some sea salt on top of the pizza. Isn't it starting to look good? Tear some fresh basil leaves and distribute across the top of the pizza. Drizzle some Olive Oil on top sparingly. Now that you have assembled your whole wheat pizza, now is the time to change the oven from the broiler, which was preheating your stone, making it extra hot, to bake at 400 F. Remember that we were pre-heating the stone by using the broiler? It is important not to forget to switch it to bake or you will have a very burnt pizza. Place your whole wheat pizza that is on the pan (or screen) directly on the stone pan and all. Bake it for about 15 minutes or until it looks nice and toasty brown. Take the whole wheat pizza out of the oven when finished cooking to perfection and let it sit for about 4 minutes before transferring it to a pan without holes for cutting and devouring. Now, you can enjoy your whole wheat pizza guilt free and with all the calories that you saved, you can enjoy a nice glass of Chianti or Pinot Noir with your delicious pizza. It will be crisp on the bottom and well browned, but not burned. It should look like the picture of the whole wheat pizza that I made on the top of this post. 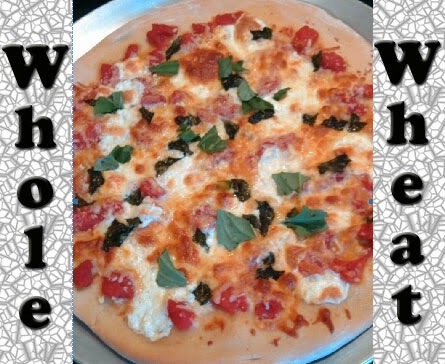 So, I hope you have enjoyed making this awesome whole wheat pizza! It satisfies the inner wild child in all of us when we are dieting. It is so tasty, that you will want it even if you are not dieting. In my opinion, pizza shouldn't have as much cheese on it anyway. There is enough on this whole wheat pizza to satisfy the melty cravings, but not so much that you feel clogged after eating it. You will find that cooking like this is fun, healthy and delicious. It is hard to believe, but kids even love this pizza! Just don't tell them that it is whole wheat pizza and they will be more than willing to try it. Enjoy this Italian Recipe and please give it a try.